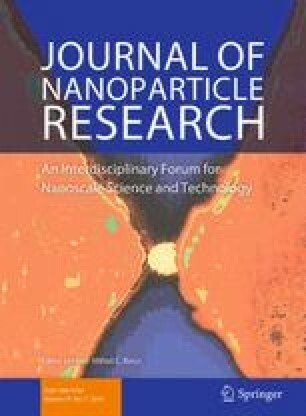 The present study reports the biosafety assessment, the exact molecular effects, and apoptosis induction of newly developed chitosan-silver hybrid nanoparticles (Cs–Ag NPs) in HepG2 cells. The investigated hybrid NPs were green synthesized using Cs/grape leaves aqueous extract (Cs/GLE) or Cs/GLE NPs as reducing and stabilizing agents. The successful formation of Cs/GLE NPs and Cs–Ag hybrid NPs has been confirmed by UV–Vis spectrophotometry, FTIR spectroscopy, XRD, and HRTEM. From the TEM analysis, the prepared Cs/GLE NPs are uniform and spherical with an average size of 150 nm, and the AgNPs (5–10 nm) were formed mainly on their surface. The UV–Vis spectra of Cs–Ag NPs showed a surface plasmon resonance (SPR) peak at about 450 nm confirming their formation. The synthesized Cs–Ag NPs were found to be crystalline as shown by XRD patterns with fcc phase oriented along the (111), (200), (220), and (311) planes. The cytotoxicity patterns, the antiproliferative activities, and the possible mechanisms of anticancer activity at molecular level of the newly developed Cs–Ag hybrid NPs were investigated. Cytotoxicity patterns of all the preparations demonstrated that the nontoxic treatment concentrations are ranged from 0.39 to 50 %, and many of the newly prepared Cs–Ag hybrid NPs showed high anticancer activities against HpG2 cells, and induced cellular apoptosis by downregulating BCL2 gene and upregulating P53. Ibrahim M. El-Sherbiny and Ehab Salih have contributed equally.